Some December treats from Georgia and South Carolina are coming to DC this month. Since August, Word, Shout, Song:Lorenzo Dow Turner Connecting Communities through Language has been on exhibit at the Anacostia Community Museum. 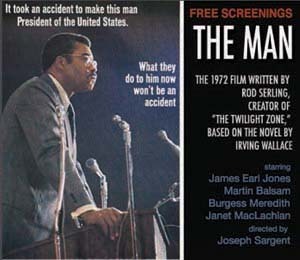 The exhibit has been extended through July 2011. Sunday, December 12 (2 PM), master percussionist/composer David Pleasant presents “Drum Folk,” a participatory workshop and discussion that highlights the sounds, movements, and histories of coastal and Sea Island Gullah-Geechee culture. In 1993 Pleasant created “RiddimAthon! 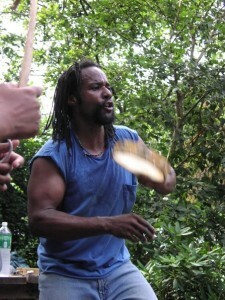 Inc.,” a performance and teaching method developed from a synthesis of African, Caribbean and African-American musical traditions featuring Gullah (Georgia and South Carolina’s Sea Island) culture. His rhythm-effects vocals and drum-voice-body techniques have been featured in numerous theatrical and broadcast programs including: “Reading Rainbow” (PBS), MTV Unplugged; “ABC Nightline/Primetime”; Nickelodeon, Disney Channel and others. David’s been featured on this blog before. Recently he’s been performing in Rome and they’re diggin’ it. I hope more Americans will get more excited about home grown artistry. 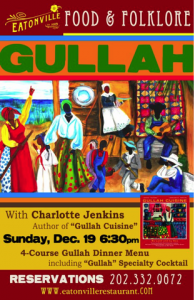 Gullah Cuisine’s Charlotte Jenkins is coming up to DC from Mt. Pleasant, South Carolina to join Eatonville Restaurant’s new chef, Garret Fleming (the secret’s out) in the kitchen for a special feast, Sunday, December 19th. Menus is TBD by Mrs. Jenkins. I’ll have some more of her fish head stew. The 4-course meal will include a book signing. Charlotte Jenkins’ Gullah Cuisine: By Land and By Sea is a collection of stories and recipes taken from Frank and Charlotte Jenkins’ lives and traditions in and outside their Gullah family kitchens. The narrative for the book was written by Fleming’s godfather, William Baldwin. There’s always a connection. Check out this post featuring Charlotte Jenkins in her restaurant on the Eatonville Restaurant Food Stories blog. 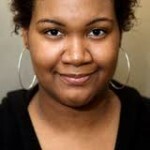 Update: Charlotte Jenkins will sign her book at the Anacostia Community Museum, Saturday, December 18 at 11 AM. Starting November 26, this blog may experience some interruptions due to necessary site maintenance. If all goes well Eclectique916.com hopes to be back on-line and updated by November 29. I defer this post to my 2008 Thanksgiving post – still one of my favorites. Here’s the link. SUFFOLK, Va. (WAVY) – The City of Suffolk made history Wednesday night. Elected leaders agreed for the first time in Virginia’s modern history to give locally owned land to native residents, without a lawsuit. Chief Bass has worked toward creating Mattanock Town for about a decade. He and several other speakers said it will bring the Nansemond heritage back to the city. Mattanock Town would include hiking trails, picnic areas, Pow Wow grounds, and a museum. Several speakers urged council to give land at Lone Star Lakes Park to the Nansemond Indian Tribal Association (NITA) for the authentic village. “Please support Chief Bass and the project he’s planning to do,” Catherine Jones of the Chuckatuck Civic League said. Members of the Nansemond tribe trace their roots back to the 1638 wedding of Captain John Bass and a woman named Elizabeth, who was the daughter of a Nansemond Chief. The project is expected to draw tourists to Suffolk. Native American education will also be available which would help Virginia students fulfill Standards of Learning requirements. Council members voted in favor of the plan 7 to 1. Leroy Bennett who represents the Nansemond Borough voted against the Development Agreement and land transfer. After the public hearing, Bennett asked if there were plans to upgrade the roads leading up to the property where Mattanock Town will be located. Bennett said he had concerns about traffic and safety. City Manager, Selena Cuffee-Glenn explained that there are currently no development plans outside of Lone Star Lakes Park, so restrictions or requirements were not a part of the deed transfer discussion. There is a list of requirements NITA must comply with for the deed transfer to be complete. On the list are prohibitions of gambling and casinos, as well as an agreement that NITA will fund any improvements to the property. Lone Star Lakes Park is nearly 1100 acres of undeveloped property, including wetlands, in the Chuckatuck section of Suffolk. Mattanock Town would cover approximately 70 acres, of which NITA contends only 44 acres would be buildable. The rest would be preserved and used for nature and environmental education and scenic overlooks. An existing cabin at the park the city currently rents to the public will eventually become NITA’s property. However, staffers announced at the council meeting Wednesday that the City will honor all existing reservations through August of 2011. Any and all posts, rants and raves about the film adaptation of Ntozake Shange’s choral poem, for colored girls who have considered suicide when the rainbow is enuf, have gotten just what’s coming to them…attention, retweets, ping backs, Facebook recommends. I remember many moons ago, a young Shange, hot off the success of her “for colored girls” Broadway run, gave the commencement address at the Duke Ellington School of the Arts. She was accessorized from head to toe–I mean little girl barrettes and gummy bear colored jelly bean sandals. [That’s what they wore in those days.] I often wondered how those jelly bean shoes survived hot NYC asphalt in August without sticking to your feet. Shange strutted up to the microphone and her first words were…. In Genesis, the first words are “Let there be light.” For some reason, the first words of Shange’s graduation speech, sent my mind into a darkness of indifference. I suppose we were both of our ages. Though she was probably light years ahead in life experiences than I, for some reason, I felt there was still many more life lessons ahead of us to learn. For all the success and raves about “for colored girls….” at that time I was asking for the light especially for graduates who were about to embark on the next chapter. Where there is a woman, there is magic. Need I say more? This is a book about 3 sisters (something about 3 in stories about sisters) in the South Carolina Lowcountry. They are all artists. 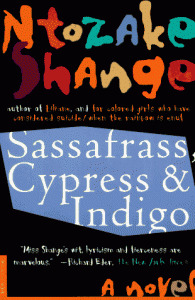 Sassafras writes poetry and weaves; Cypress dances; Indigo makes dolls. Sassafras and Cypress move about the map; Indigo stays put with the old ways and the magic. I read it many years ago when I was a cloth doll maker, and like Indigo, I used to play the violin. The book is a combination of poetry, prose, letters, recipes. Not perfect fiction, but perfectly yummy. 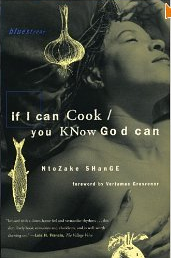 I don’t own a copy of Shange’s If You Can Cook, but again, it looks like a yummy read. I’ll give Shange’s first words to a chapter title: “What’d You People Call That?” followed by a quote from one of Edwidge Danticat’s short stories in Krik Krak. In this volume Shange appears to have woven together recipes, and stories of collard greens, cornbread, Middle Passage, Brazil, and music, producing another Shange feast. Though I’m not one to lift up the virtues of pigs tails or feet, I do respect their cultural and sometimes culinary significance. Will If You Can Cook make you fat or phat? There’s something intoxicating about being magical or living in a magical reality. For some it’s a life raft or even compass for a complex life of ebb and flow. For others the desire for magical living can be like a house of mirrors, reflecting the beauty and grief of past, present and future simultaneously, with no exit signs. Sure thing, we can’t get the rainbow without the rain. The magical must come to some peace with the plain and simple. Rainbows also cannot be seen without the light. Even in darkness, be like Harriet Tubman – follow the North star. And that is good.